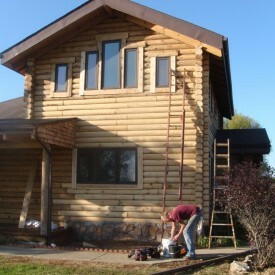 When you think of 888-LOG-GUYS, think of the best log home restoration company in the Ladue MO area! And there is no other company that could give you 100% satisfaction on log home restoration, log home repair, log home chinking and caulking, log home improvement, and log home maintenance plus the assurance that we will always be there to keep your log home in outstanding condition for a lifetime! Call our number to speak with a log home specialist, or ask for an estimate from our website! 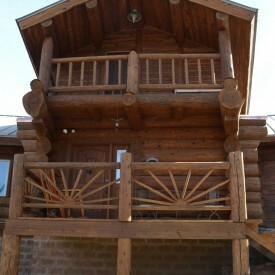 888-LOG-GUYS can restore your log home from beginning to end and everything else in between. 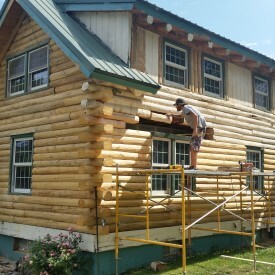 Our log home restoration process starts with media blasting or stripping the logs of their original stain before sanding the logs. Next, our crew will clean the logs using a borate treatment. 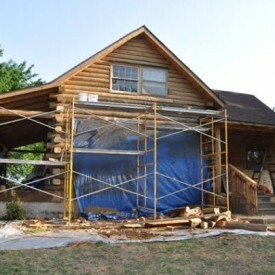 After that, chinking and caulking will be applied before re-finishing the log home with the stain that will impress all of your neighbors and friends! 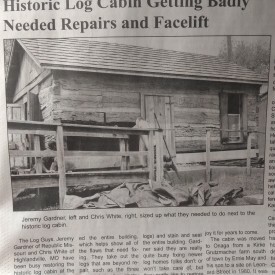 Call us to find out what your log home needs to have it restored! When a log home is not properly maintained, several different kinds of elements could affect the health of your logs. You may have some logs in need to be repaired or replaced due to log rot, water damage, bug or insect damage, bird damage, or severe weather. No matter the cause of the damage, our experienced crews can fix your log home! Our company has over 15 years of log repair and log replacement experience, and we will make sure each log is stable and strong to keep your log home preserved for years to come. You know that white stuff in between your logs? 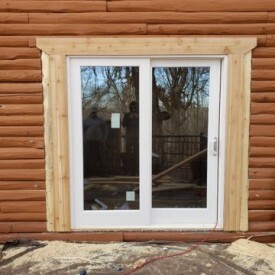 If properly applied, chinking or caulking will protect your log home from air drafts around your windows, bugs and insects invading your log home, and water leaks running down your walls. Are you experiencing these log home problems? Call 888-LOG-GUYS to find the best solution for your log home in the Ladue Missouri area! If there is something you would like to add to your log home to make it even more beautiful, then ask 888-LOG-GUYS to get it done for you! What log home construction ideas do you have in mind? We can construct log staircases and log railings. We can build decks, porches, and patios to beautify the exterior of your log home. If you have other ideas, then contact us by phone or through our website to speak with a log home improvement specialist! The maintenance plan for your log home may be different than most, so it is best to get advice from log home maintenance professionals. Call 888-LOG-GUYS to find out how the best way to maintain the upkeep of your log home! You can bet that our company will stick around to administer your maintenance plan and keep track of each time your log home is due to be cleaned, re-stained, and sealed. We are here to be your log guys for a lifetime!